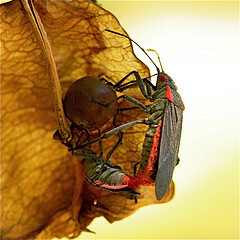 Mating J. haematoloma feeding on Koelreuteria elegans. Jadera haematoloma were featured on Time.com in their piece on the "Top 10 Weird Insect Mating Rituals". Male J. haematoloma are known to guard their mates by prolonging copulation for days. This prevents other males from mating with the guarded female, thus increasing the chances that the guarding male fathers some of her offspring.